Many men buying a suit for the first time don't know what suit size is. Suit size is a whole different sizing system than buying pants or casual shirts. Mens suits are sized by their jacket chest size and have notations of Regular, Long and Short that will correspond with the man's height for a proper fitting suit size. The chest size has always been the primary way to measure for one's suit size and should always be the way to choose your size no matter what. 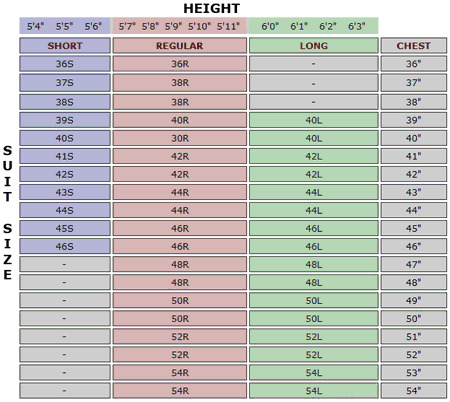 If you don't know what suit size you wear, feel free to use our mens suit size chart to help you figure out what size suit you need to order if you haven't bought a new suit in a while or it's your first time. If you are unsure of what size suit you need to order online, getting properly measured would be the best recommendation. All you need to know is your chest size and your height and our suit size chart will direct you to the proper size that you need to order. Mens suits come size in Regular, Long and Short lengths which determines how long the sleeves are and the length of the jacket so it fits you properly depending on your suit size. Now let's just say for example that your chest measures about 42 inches around and you're 5'11" tall, you're going to need to order a size 42 Regular suit. This suit size should be the rest choice for you to go with. These are industry standard suit sizes with the matching size pants. Maybe your waist is a little bit smaller than the suit sized pants and you're really 34 inches in the waist and not the listed size 36 inch waist which comes with the suit jacket. The most important thing to know is that the size of the jacket fit you the best because the cost to have a tailor adjust the jacket in one form or another whether letting in the torso or letting it out cost much more than having a tailor take in the waist two inches to fit you properly if that is what is needed. We recommend that in most cases, two inches should be most you need to have the pants on a suit taken in and still fit and look properly. Having a either a tailor or seamstress measure your suit jacket size properly is the most important thing you can do for determining what size suit you need to order for a correct fit and best results when shopping online. Ordering a suit size by your waist size is not the best way to choose your suit size. We are all built differently with either broad shoulders, narrow shoulders or medium shoulders and this should all be taken into consideration when it comes to finding out what your suit size is. See what's cooking in the world of Mens Suits on sale here, Stacy Adams Suits in the very latest styles and Mens Fashion Suits straight from New York City. If You have any questions on what size to order, Feel Free to Call Us or Email Us. Call us at (800)561-1708 Monday-Friday. 9:30AM-4:30PM EST. Feel Free to shop online at ContempoSuits.com for Zoot Suits Need something for formal night, our selection of Tuxedos will surely please. Check out the very latest style Stacy Adams Shoes. You'll bring some serious noise when you're seen wearing Belvedere Shoes at the club. If you like hand made dress shoes with Italian style and exotic skins try Mezlan Shoes of Spain.